I seem to be just on time today :) Sepia Saturday 202 offers "№1" theme - a portrait of a couple. I really like this one. 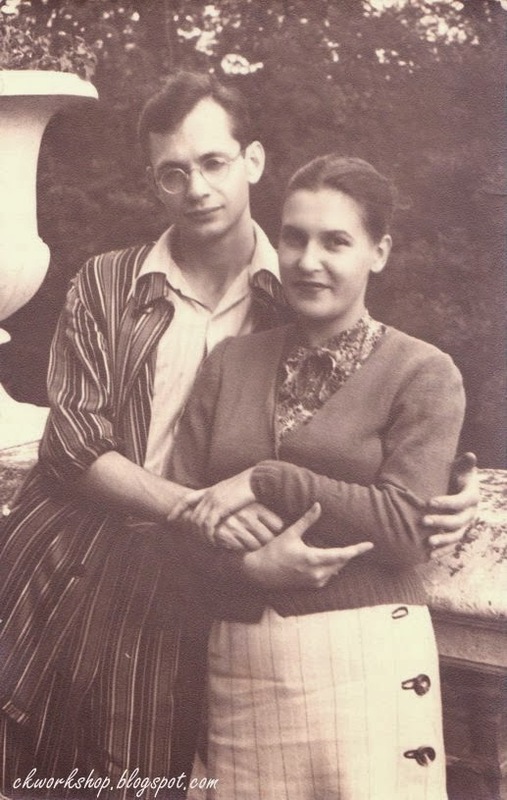 My Grandmother Gratsia (Russian for "Grace") captured with Mikhail, my Grandfather. He's wearing striped pajamas and thus I conclude that she was visiting him in sanatorium - such pajamas were given to all patients staying in Soviet sanatoriums or hospitals. He suffered from tuberculosis and had to spend several months a year in sanatorium to receive due treatment. Всем привет! Я сегодня опять с "Сепией по субботам". В центре внимания - винтажная фотография пары. У меня нашелся дивный снимок. Бабушка Грация и дедушка Миша. Оба молодые, подозреваю, что ещё неженатые. Судя по всему, ужасно влюбленные - стоит только взглянуть на затейливое хитросплетение ещё не окольцованных рук :) Дедушка в полосатой пижаме, за плечами - каменный вазон. Без сомнения, она навещала его в санатории, где он лечился от туберкулеза. Возможно, в санатории имени Герцена. Смотрю на это фото годами, и всё думаю - знает ли она, что у неё потерялась пуговица? Your grandmother was beautiful. It's funny that you notice the missing button -- I certainly didn't until you pointed it out. A lovely portrait to have, rather than the formal posed shots we more often have of that generation. A nice take on the theme & a lovely photograph. Their hands are lovely...so much expression there! Nice photo, indeed! The picture on your profile looks a lot like your grandmother. Thank you! She was known as a beauty, thus it's compliment for me. Lucky he survived. I have a couple of relatives who died from tuberculosis. He actually did not :( But he lived long enough to give life to my father. 1969 took his life (my Dad was 14 years old, and it was 10 years before I was born). A lovely looking couple: so sad that he was afflicted with illness in that way. Delightful photo. Grace was a beauty.